We were having some guests over a couple of nights ago and I wanted to serve them something that wouldn’t be too time consuming to make, because I was going to be short on time, and it had to be something I already had on hand because I didn’t have time to run to the grocery store and it had to go a long way and feed everyone. Ugh! That’s a test! I remembered I had two whole chickens in the freezer and thought I could figure out something to do with them. 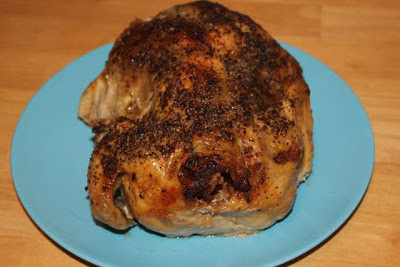 I am never a fan of roasted chicken because they never turn out as flavorful as I would like them to be. I started looking around the web and came across this recipe and thought it was perfect. It was definitely perfect! It honestly could not have turned out any more perfect. This chicken was fantastic! The flavor was amazing and the house smelled divine while it was cooking. I couldn’t believe how moist it was! I couldn’t have asked for a better presentation. My guest raved about it which made me very proud. This is a must try if you have an extra chicken in need of a cooking! Preheat oven and a roasting pan to 400°F. Rinse the chicken and chicken cavity with water and pat dry with paper towels. Rub salt over the inside of the cavity. Grasp the skin at the tip of the chicken breast and gently pull up. Use your fingers to gently separate the skin from the breast meat, taking care not to tear the skin. Sprinkle a little salt into the gaps and insert as much of the chopped herb mixture as you can. Drizzle with a little olive oil. Stuff the cavity with the lemon, bay leaves, rosemary, and any remaining herbs and the quartered orange. Pull the skin of the chicken breast over the breast so that none of the meat is exposed. Tuck in the wings and truss with kitchen string. Rub some olive oil over the chicken and sprinkle all over with salt and pepper. Carefully remove the hot roasting pan from the oven and add a little oil to the bottom of the pan. Place the chicken on one side, breast side down, on the roasting pan and put it back in the oven. 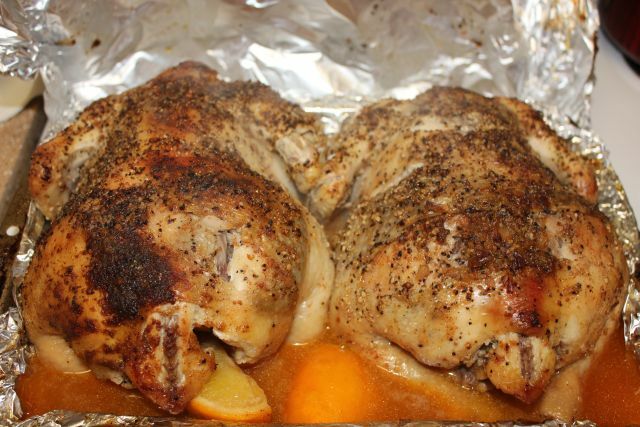 Cook for 5 minutes, then turn the chicken so that the other breast is on the pan and cook for another 5 minutes. Starting off by cooking the chicken this way will help brown the breasts. Then turn the chicken over so that it is back-side down. Cook for 1 hour, or until the juices run clear (not pink) when a knife tip is inserted into both the chicken breast and thigh, about 165-170°F for the breast and 175-180°F for the thigh.